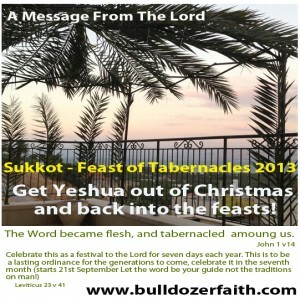 Sukkot, the Feast of Tabernacles is the last of the Fall Feasts. The Spring Feast were fulfilled during Yeshua’s first coming. The Fall Feasts are yet to be fulfilled. Sukkot is one of three pilgrimage Feasts to Jerusalem. By tradition it is called the Season of our Joy. It’s a Holy Convocation, a set-apart, appointed time, a rehearsal for the Most High’s grand finale. During this Feast, which has not yet been fully realized, believers can look backwards as well as forwards. For through calculating the time of John the Baptist’s birth, it can be demonstrated that on this Feast, the Light of the World took on flesh, was wrapped in swaddling clothes, and laid in a sukkah. John 1:14 hints at it: “And the Word became flesh and tabernacled among us.” Some translations say dwelt among us, but the Greek word is sk?no?. It means tabranacled! So at the Feast of Tabernacles, we can look back, but we also eagerly await a future fulfillment. It will be that time when Messiah returns for the final harvest of souls and His Wedding Feast. This is the grand finale Convocation in the Most High’s two-part plan: Salvation and Restoration. Salvation He fulfilled at His first coming, commemorated by the Spring Feasts. Restoration, He will fulfill at His second coming. The events of which, He has typed and shadowed in his Fall Feasts. Sukkot is a seven day feast. But it has a special eighth day called Shemini Atzeret. While seven signifies completeness, eight tells of new beginnings. In God’s economy, a day is as a thousand years. Yeshua, Lord of the Sabbath, will rule and reign from Jerusalem during His thousand-year Sabbath day, and on the eight day, He will create a new Heaven and new Earth. Leviticus 23:40 instructs us that the first day of the Feast is a Sabbath (a day on which no regular work should be done). We are to take the fruit of good trees, branches of palm trees, twigs of leafy trees, and willows of the stream, and rejoice before YHVH for seven days. John 7:37-38 tells of what Yeshua did during the seventh day of this feast. But first to understand the significance, we must understand how this feast was observed during that time. Shortly after sunset, in the court of the women, using the priests’ worn out undergarments, called swaddling clothes, as wicks, the Priests lit four gigantic lamps, each containing seven to eight gallon oil bowls. Once ignited, Jerusalem blazed! Rejoicing men sang and danced late into the night. Together, the High Priest and his helper would pour out the libation—the living water and wine—on the southwest corner of the altar. It was a beautiful shadow picture of the prophesied out-pouring of the Ruach Ha Kodesh—the Holy Spirit. In John 7: 37, the Apostle John records what happened—what Yeshua said—that particular seventh night of the Feast. In the last day, that great day of the feast, Jesus stood and cried, saying, If any man thirst, let him come unto me, and drink. He that believeth on me, as the scripture hath said, out of his belly shall flow rivers of living water. Yeshua used the pageantry of their celebration in observance of seventh day of the Feast, the water libation, the day known as Hoshanna Rabbah—the Great Salvation—to make his decree. He was the source of that poured out Living Water. This celebration was about Him! Each of the Feasts, the Spring and the Fall Feasts, are about HIM! And YHVH commanded they be celebrated forever. The Torah instructs that beginning on the 15th day of the Seventh month (Tishri on the Hillel II calendar), Israel (both the natural branches and those grafted in) are to dwell in a sukkah (a booth, tent, temporary dwelling) to commemorate YHVH’s provision in the wilderness. Since most of us do not live in Israel, and can’t afford to travel there, and because there is no longer a temple from which the proscribed sacrifices can be made, here are some practical ways in which we can celebrate this joyous Feast until Yeshua’s return. At that time, all will keep this Feast in Jerusalem, or they will have no rain. It’s a three sided booth with a roof through which one can see the stars. Or set up a tent. Plan a camping trip for eight days with your family or congregation. Decorate your temporary dwelling with items that remind you of the many blessings for which you are grateful. Starting the first day–which is a Sabbath, so plan ahead to avoid routine work–take the fruit of good trees, branches of palm trees, twigs of leafy trees, and willows of the stream, and rejoice before YHVH. Do this for seven days. Or you can go on line and order the Lulav and Etrog. It’s a prepackaged deal. The lulav binds together willow, palm, and myrtle. The fourth species, the etrog, is a citron. It’s a sweet smelling citrus fruit grown in Israel. By tradition Jews and many Messianic congregations wave these as they recite Hallel (traditionally Psalms 120-135) over the seven days. For those unable to camp out for the duration of the Feast, try to share a meal in a Sukkah with family or friends daily. And start planning vacation time now for next year’s Feast. It will be worth it! Each day of the Feast, spend some quiet time in your temporary dwelling, focusing on Psalms of praise and thanksgiving, or even reading the Ten Commandments. During this feast you should give a special “thanksgiving offering” to the Lord, and it’s a good time to share with those less blessed. Sing and give praise every day, with other believers when possible. Many congregations set up camp sites. If you don’t have a congregation in your area that keeps the Feast, plan to keep it somewhere with congregations that do. It’s a great time for fellowship. 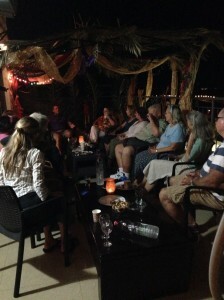 Look on the internet for congregations keeping Sukkot, and make plans to join them. One day, we will all keep this Feast in Jerusalem. On the seventh day, plan a water libation ceremony of your own, and read John 7:37. And on the eighth day, which is a Sabbath like the first, focus on the New Heaven and Earth that will be created after the thousand-year Sabbath rest known as the Millennium. And, since Yeshua said Heaven and Earth would pass away, but His WORD would never pass away, those congregations with TORAH scrolls might want to celebrate Simchat Torah—rejoicing with the TORAH. On this day, the TORAH scroll—the first five books of Scripture—is re-rolled for another year of weekly readings. Joyous participants carry a re-rolled scroll on their shoulder, while singing and dancing and praising the Most High. It’s a wonderful way to conclude this eight day Final Feast of YHVH’s. For those new to keeping this Feast, and who don’t have a TORAH scroll, dance before the Lord with your Bible. Or make a TORAH scroll replica! What fun for the kids! But most of all, rejoice! Rejoice before the Most High, rehearsing His soon coming final in-gathering and the Lamb’s glorious Wedding Feast. This year we are unable to Travel to a feast site ,due to lack of funds,however we will spend it at home and on line with the Rood Awakening Ministry with Michael and Aurthur ,,listen to worship songs,we live in NYC in an Apartment B l d so there is no space to build a Booth but next year we will if Life is spared be at a feast site.until then Have a blessed F O T everyone and to You Br ..
Great. Thanks.. Happy Sukkot holiday feast.